Why do Star Trek's starships look the way they look? Is the ship I sketched up well-designed? Strictly speaking, such questions can only be answered by a 23rd/24th century starship engineer. Star Trek is only a show, and there is no way we could explain or understand how starships work, let alone build them and test them in space. 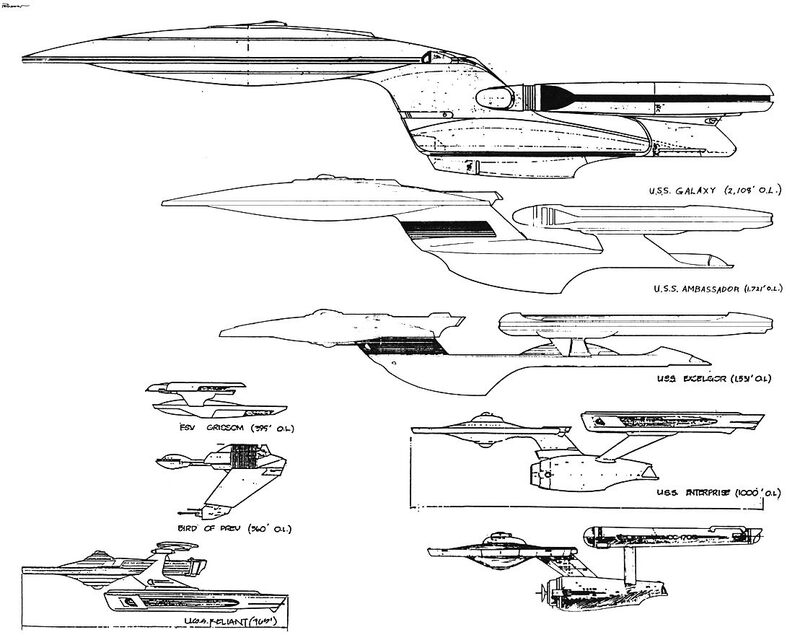 Nevertheless, the design of Star Trek ships, official and fan-designed, should not be haphazard. First of all, they should comply with real-world engineering principles wherever possible, at least as far as physical dimensions and basic mechanical properties are concerned. In addition we have guidelines in the form of the design history and the aesthetics and lineage of starships, of Gene Roddenberry's design rules and of secondary literature such as the Star Trek: The Next Generation Technical Manual. All of them show us certain requirements, which may be without a foundation in real physics and engineering, but which make up the distinctive "Treknological" rules of the Star Trek Universe. Alas, Star Trek websites and communities show lots of insufficiently considered starship designs, often cut-and-paste work combining components of different ships that are scaled up and down at whim. This is one reason why I have compiled possible guidelines for myself and for other fans interested in starship design, in order to improve our work. The rules are not meant as directives, but may provide an idea what a "technically correct" ship could look like, which would most likely be a beautiful ship in my opinion. Important notice This article focuses on design aesthetics and on the assumption that these aesthetics reflect engineering principles of Starfleet of the 23rd/24th century. It is not meant to be an assessment of whether these designs are realistic, or of how to design a realistic starship with present-day knowledge. Please consider this before you file a complaint. The Star Trek Art Department as well as various fans continually come up with new starship designs, predominantly Federation ships. All these designs have evolved from Matt Jefferies's original Starship Enterprise and its distinctive saucer/engineering/stardrive configuration. The first prominent publication featuring starships other than the Constitution class was the Star Fleet Technical Manual by Franz Joseph Schnaubelt in 1975 (reissued 1991). 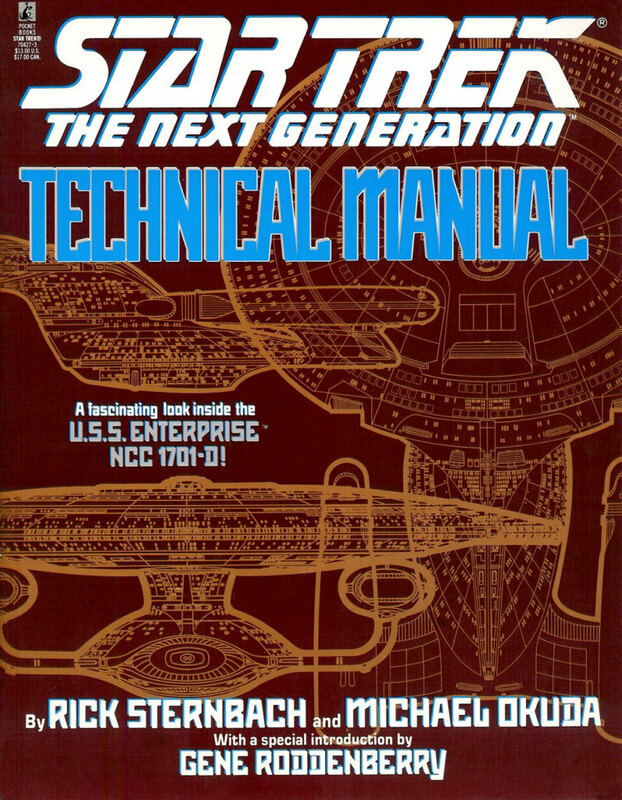 This book became the first incentive for fans to create new starships by rearranging familiar starship components, long before the official Star Trek production discovered this possibility. Ships of the Star Fleet (vol. 1) 2290-2291, first published in 1987, continues with this concept. Recently, the internet has become the by far most productive platform, and thousands of websites show tens of thousands of fan-designed starships besides the canon classes. Creating new designs for "Star Trek III"
The Miranda class (USS Reliant) as the first canon Starfleet design apart from the original and refitted Constitution class appeared in "Star Trek: The Wrath of Khan" as late as 1982. The first starships not re-using components of the Constitution class were the Oberth class (USS Grissom) and the Excelsior class in "Star Trek: The Search for Spock" in 1984. Since then, a wide variety of canon starships has been developed, some of them built as large-scale studio models, some as kitbashes like the infamous ships from the Deep Space Nine Technical Manual, and finally the CGI (Computer Generated Image) ships from the latest movies and series. Despite all the design variations throughout more than 30 years of Star Trek and more than 200 years of Starfleet history (not to mention parallel timelines), almost all ships share common design features, and they can be recognized as Starfleet ships also without lettering. The following are Gene Roddenberry's official design rules. I found them at Jim Stevenson's Starship Schematic Database. "Years ago, I was lucky enough to attend an Industrial Design class conducted at a Star Trek convention by Andrew Probert, head of the design team for the Enterprise in ST:TMP and primary designer of the Enterprise-D. He was nice enough to relay to me the 'Unofficial Starship Design Rules' as told to him by Gene Roddenberry..."
Rule #1 Warp nacelles *must* be in pairs. Rule #2 Warp nacelles must have at least 50% line-of-sight on each other across the hull. Rule #3 Both warp nacelles must be fully visible from the front. Rule #4 The bridge must be located at the top center of the primary hull. Recently Andrew Probert confirmed at Trekplace that these are really the design rules that Roddenberry and he himself nailed down for TNG. Written like a technical documentation of Galaxy-class vessels for Starfleet personnel of the 24th century, the Star Trek: The Next Generation Technical Manual by Rick Sternbach and Michael Okuda (review) gives some insight into starship construction principles and elucidates Roddenberry's design rules, although many design issues discussed in the book do not show up in the outside appearance of the ship, which this article is mainly about. Here are some thoughts on issues raised in the book. Chapter 1.1 of the TNG Technical Manual lists the "mission objectives for the Galaxy-class project", comprising specs for the ship's propulsion, mission, environmental systems, tactical and lifetime. Although Rick Sternbach apparently conceived most of the specs when the design of the model was finished, it is obvious that usually their definition should take place at the very beginning of the design process. 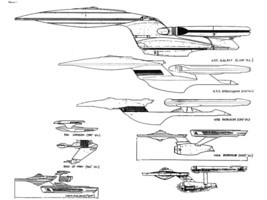 At least the basic purpose, size and speed of a ship should be known before the (24th century or 21st century) designer begins work on the actual plans, rather than marginal specs like "peak transitional surge reserve to exceed 4,225% of nominal output". The infamous Defiant size problem is an example of a design becoming inconsistent because of insufficient basic specs that are changed and thoughtlessly supplemented after the completion of the studio model. Of course, the long construction time for a "real" starship is not an obstacle to the construction of a ship on a computer or drawing board. Nevertheless, anyone who conceives a design should keep the long construction history of the USS Galaxy (2343-2356, chapter 1.4) in mind. It may be feasible to design, build and launch a new starship like the Defiant in only a few years, but this is not the normal case. The idea of hastily assembled ships as in the Deep Space Nine Technical Manual is objectionable in this regard. Chapter 5 discusses the warp propulsion system. The warp drive subject inherently comes with a lot of technobabble that cannot simply be correlated with real world physics or be used to determine the appropriate number, size and location of warp nacelles. One of the few definite statements in the book is: "A pair of nacelles is employed to create two balanced, interacting fields for vehicle maneuvers. In 2269, experimental work with single nacelles and more than two nacelles yielded quick information that two was the optimum number for power generation and vehicle control". This indicates that there are no starships with other than two nacelles. 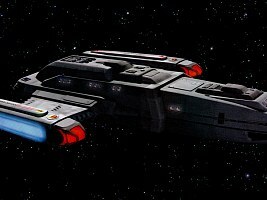 The existence of the Cheyenne class and Constellation class with four nacelles can easily be explained by the fact they do have the same symmetry as two nacelles (even one more symmetry axis), and Roddenberry's rule #1 that "nacelles must be in pairs" does not exclude that there are two or more pairs. The Freedom, the Challenger, the Niagara as well as the "All Good Things" Enterprise do not seem to violate this principle, if we assume they use Galaxy-class nacelles with pair-wise warp coils. The Galaxy warp coils, however, are vertically staggered instead of a left-right arrangement. Interpreting the above quote from the TNG Technical Manual, the horizontal nacelle arrangement insinuates that maneuvering mainly takes place in the horizontal plane, which cannot be accomplished with vertical warp nacelles or with a single Galaxy warp nacelle. Moreover, the fields of staggered coils in a single nacelle would only envelop one another, and not the ship. The same applies to the vertical arrangement of the small auxiliary nacelles (one on the top, one in the bottom) of the Prometheus saucer section. In brief, the single or three-nacelled ships or ships with any other odd number of nacelles or nacelles that are not symmetrical in the dorsal elevation do not really comply with Roddenberry's rules and the TNG Technical Manual. Roddenberry's rule #2 (50% line-of-sight) may be explained with the same reason of port-to-starboard warp field interaction. This rule is violated by the Raven. Chapter 5.5 features a schematic of the Bussard collector operation, and it becomes apparent that at warp speed hydrogen is predominantly collected from space directly ahead. It is not explicitly mentioned in the TNG Technical Manual, but quite obvious that nothing must block this trajectory, otherwise the efficiency would be drastically reduced. This is the Treknological confirmation of Roddenberry's rule #3. 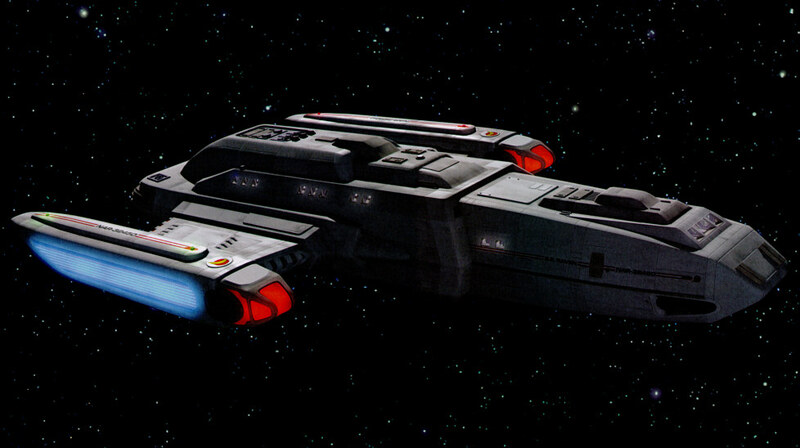 While most ships comply with it, some ramscoops are partially covered, and that of the upgraded Excelsior class is almost completely hidden behind the saucer. A "hybrid angular-curvilinear shape" for future starship hulls as mentioned in chapter 17.2 seems to have been designed for the Intrepid class, which resembles the first depicted concept, and to a greater extent for the Norway, Steamrunner and Saber classes. The development from circular to elliptical and finally triangular saucers is apparently meant to reflect changes in the understanding of warp field vs. hull geometry. This should be taken into account when designing a ship supposed to fit into a certain era, although it is not imperative. Chapter 5.3 states that the typical "aft hull undercut allows for varying degrees of field flow attachment, effectively preventing pin-wheeling, owing to the placement of the nacelles off the vehicle Y-axis (dorsal-ventral) center of mass". Although this sounds nice, there are many starships whose nacelles are located at the very top or very bottom of the ship and have no undercut, so an "amateur" starship designer does not necessarily have to care. In chapter 2 the TNG Technical Manual demonstrates impressively that the structural integrity field (SIF) actually keeps the ship in one piece during warp and impulse flight. This would enable very bizarre hull shapes in theory. Still, the power consumption of the SIF can be minimized if the ship takes advantage of a compact hull design. The required power for the navigational deflector (chapter 7.4), on the other hand, can be lowered if the collision cross-section for an obstacle is small. In this respect a good starship design may be described as sleek and slim but compact, with the Galaxy class being a nearly perfect example. 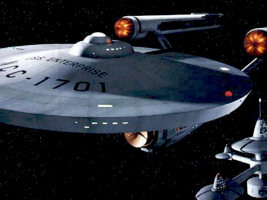 Despite the recurring argument that the bridge should not be unnecessarily exposed to hostile energy weapons, the producers put an interchangeable bridge module at the top of the saucer (see also Roddenberry's rule #4) to explain the fact that different bridge sets are used for ships supposed to be of the same class. Don't just draw or build a starship without nailing down some very basic specs. At least its origin, age, purpose and size should be known in advance. Avoid the Defiant size paradox. Don't mistake starship design for Olympic Games. Don't think that you can build an über-ship that outguns or otherwise outperforms every other design. While it can be assumed that starships are continually improved, sudden performance leaps and engineering miracles are unrealistic and silly. The same applies to monster ships such as the Vengeance. Take into consideration that most starships are slower, smaller and weaker than the most advanced ships of the respective era. The apparent use of similar components does not automatically imply that ships share a design lineage. The mere coincidence that the 200 years old Daedalus class and the Olympic class both have a spherical main hull does not mean that the latter must be derived from the first. The same applies to the "Akiraprise" and the Akira, although here the similarity at least of the models in the real world is intentional. Starship "family trees" drawn by fans may outline a rough development, but don't show actual design stages. Don't draw either a top view or a side view only. Be aware that this can hardly give a complete impression of the ship's appearance. If one view looks technically correct and aesthetically pleasing, this does not necessarily apply to the other views. The first solution is almost never the best solution. There has been long evolution of good starship designs such as the Constitution or the Galaxy (see for instance The Art of Star Trek) up to their eventually built versions that look both aesthetic and technically correct. If you just rearrange available components instead of creating a really new starship, you have to find excuses. For a 24th century starship engineer it is a huge amount of work to change the location of a major component such as a warp nacelle or to combine components of different starships, considering that countless power conduits, data transfer lines, environmental systems, Jefferies tubes and turbolifts have to be relocated and the whole computer system has to be reprogrammed. It's everything but simple. The benefit of the DS9 Technical Manual kitbashes is already hard to explain, but it is virtually impossible to build high-performance ships in this way as some fans insist on. Read more about kitbashing. Ever since Matt Jefferies conceived the original Enterprise, Starfleet ships are intentionally laid out to be sleek and to have only few and well-defined external components. Like with kitbashing too, be cautious when adding additional components to existing ships. As popular as the Enterprise-D from TNG: "All Good Things" may be in fan circles - the additional nacelle, cannons, spoilers and spikes totally ruin the graceful lines of the ship and turn it into an immature "space dragster". If not impossible, scaling is the worst choice of designing a new part based on a smaller or larger prototype (see Bird-of-Prey size paradox). A smaller or larger part will inherently have completely different mechanical, electromagnetic and subspace properties, so a completely new design and simulation is inevitable. The result might look similar to the original component, but not the same. The top view of the "Akiraprise" is almost identical to that of the 200 years younger Akira, and even several details are the same on the two ships. They have actually more in common than many Starfleet ship classes of the same era. It is almost inexplicable why the "Akiraprise" should be 200 years ahead of her time, or the Akira 200 years behind. No matter how much you like a certain existing ship design, imitating its look and transferring it to another time is a bad way to start. A good designer who wants a new ship to be "a tip of the hat" to another design should do this by retaining only the basic configuration while changing the ship's lines (as it was always nicely done with the various Enterprises from -nil to -E). Windows and lifeboats are arranged deck-wise, and one deck is 3-4m tall. Be aware that this predominantly determines the size of your ship, no matter what you say in your specs. There are various lists of canon starships, so it should be possible to give your design a name and a number that fits into the Star Trek chronology without ambiguity. 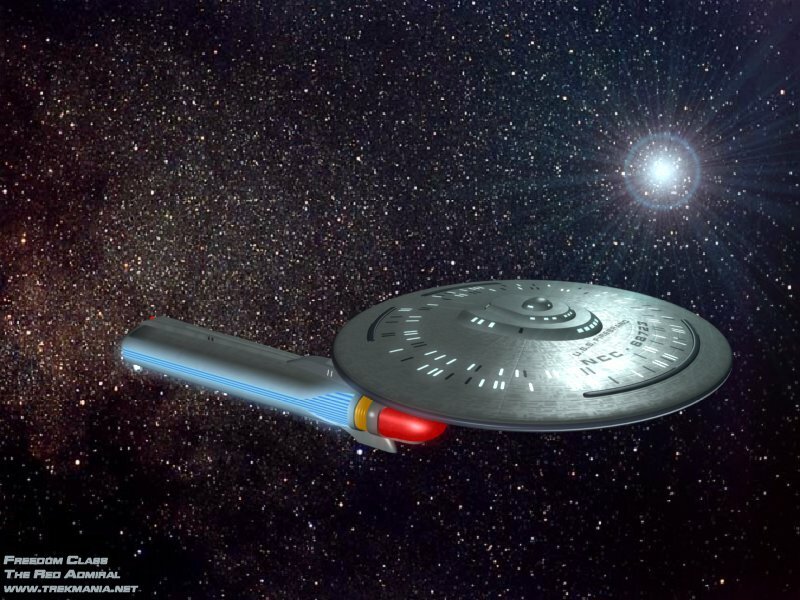 Furthermore, NCC-XXXX-A,B,C,D,E is an exceptional case and should not be applicable to starships other than the Enterprise. Even the TNG production crew themselves fixed the Yamato registry that was NCC-1305-E at first. There are some people who design amazingly realistic looking ships. Not everyone has their artistic talent, but be aware that this only one aspect of a design. So don't give up after the first try, your result will definitely become better the more you work on it.